Sprouting is a way of releasing the nutrients stored in whole grains. 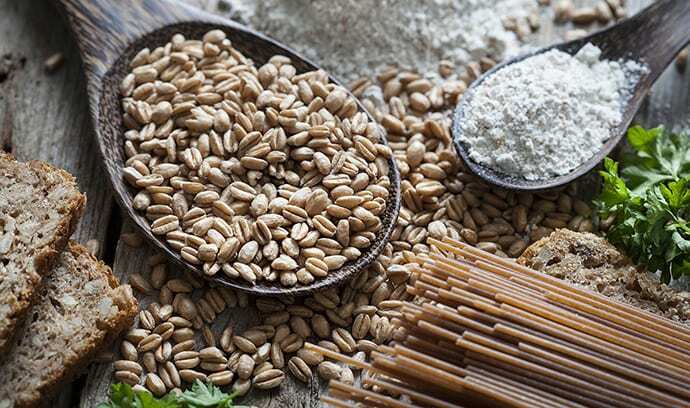 If you sprout your grain or seeds before baking you actually include living nutrient-rich food, which in turn can provide an increased level of protein, vitamins and minerals then the normally refined flours. All the B vitamins, vitamin C, folate, fibre and essential amino acids are often missing in grains but the sprouted versions contain higher levels. It is shown that the sprouted grains appear to be a reduced allergenic for those sensitive to grains. There are a few different types of sprouted grain bread. Some are made with added flour, some have added gluten and there are some which have very few additional ingredients so please read those labels. In addition, soaked and sprouted grains will no longer contain phytic acid, it will have been entirely eliminated. Phytic acid is contained in nuts, seeds and grains but it can inhibit the absorption of the vitamins and minerals. Eliminating the phytic acid in the grain means that your body can utilise the bio-available nutrients without inhibition. Meaning that you get all the benefit of the product you are consuming. Finally, as you may or may not be aware, all food items have a Glycaemic Index rating, this is the rating given to food in comparison with the bodies processing of glycogen or sugars. The blood sugar will spike upon consumption of foods and will do so at varying rates. The more similar the product is to the response of pure sugar is how the value of the rating is determined. A product with a high GI rating will spike your blood sugar in accordance and comparable to the glycogen response. Hence when selecting a bread a lower GI rating would be preferable. Focaccia is, in fact, the bread that contains the lowest sugar and consequently displays a lower GI rating. Once you have digested all this food for thought, you can confidently approach the supermarket bread maze with knowledge and the expertise to navigate your way efficiently through to satisfaction.